• Approximately 1 in 5 LGBTQ students were taught positive representations of LGBTQ people, history, or events in their classes. 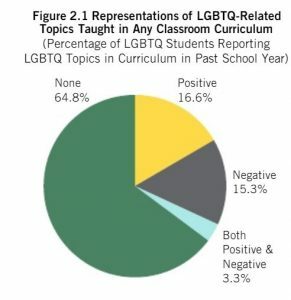 Nearly the same amount had been taught negative content about LGBTQ topics. 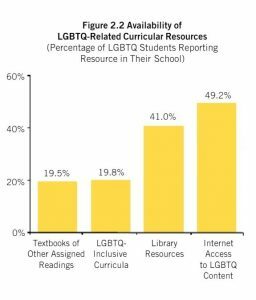 • Most students did not have access to information about LGBTQ-related topics in their school library, through the internet on school computers, or in their textbooks or other assigned readings. An equitable focus on issues honoring a range of diverse expressions related to gender and gender non-conformity in the ELA classroom is necessary to meet all students’ needs and to help all students develop complex ways of understanding gender. . . . Because gender equity is a universal issue, it is imperative that English language arts educators develop a lens through which they can see and think critically about gender, gender expression, sexuality, and non-conformity. Through this lens, students would consider how gender and sexuality are represented in a range of texts; would gain awareness regarding gendered and heteronormative expectations gender; would work with texts featuring a diverse range of people (including those who are LGBTQ and/or gender non-conforming); and would express their own perspectives regarding these representations and expectations. An LGBTQ+ Identity Toolkit for Educators by sj miller. Legacy of Pride: We Are Decidedly Not Other; We Are Teachers; We Are One by Jocelyn Chadwick. 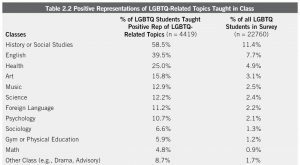 Making a Safe Space for LGBTQ Texts into Your Classroom by Millie Davis. “It is one thing to say that teachers should be reading books with LGBT characters or themes with their students, but it can be quite another to actually do it, especially in contexts that might not feel supportive. To assist teachers who are stepping into unfamiliar waters,” Jill Hermann-Wilmarth and Caitlin L. Ryan have recommendations. Find a long list of policies, articles, and ideas.